The Hotel Country Inn & Suites is located in a residential area in Ciudad Cariari, close to the avenue that connects Juan Santa Maria International Airport – SJO with San Jose. This hotel has easy access to shopping centers, restaurants and business districts. Among its amenities, there is a restaurant overlooking the garden, a gymnasium, two outdoor swimming pools, a Jacuzzi and a business center. At the Hotel Country Inn & Suites there are 79 Superior rooms, 4 Junior Suites, 7 apartments and a Presidential Suite. The new Executive floor offers an exclusive atmosphere complemented with customized service: healthy buffet breakfast served at the private lounge on the same level, wireless Internet and free local calls. All rooms feature free high-speed Internet access, air conditioning, safety box, iron & ironing table, hair dryer, telephone, cable T.V., coffee maker, laundry service, complimentary newspaper. 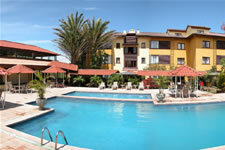 At the Hotel Country Inn & Suites there are 79 Superior rooms, 4 Junior Suites, 7 apartments and a Presidential Suite.